The Sri Lanka Army has advanced and spread across the entire Manthai Area by yesterday. The LTTE launched five counter attacks to retake the Manthai FDL which were all repulsed by the Army. The Army's motto for these undeclared and unnamed operations is 'Don't Die for Our Land. Let Them Die for Theirs'. The motto signifies the strategic objective of not fighting for control over land and forcing the Tigers to defend their own. The strategy has yielded significant successes. Field Commanders are being pushed to kill as many LTTE as possible and not to hold on to the territory gained. The operations, spearheaded by the Commando Regiment, also has the backing of the 58 Division stationed in Mannar. On the 9th, these units destroyed a bunker manned by the LTTE's elite Charles Anthony Regiment. Six bodies recovered from the scene are to be handed over to the ICRC today. The Army's desire to confront as many LTTE as possible has proven successful with the majority of the LTTE casualties being from Charles Anthony Regiment. Meanwhile the Sri Lanka Air Force is to take delivery of a sophisticated unmanned Aerial Vehicle (UAV) within the next few days. Another three are to be delivered early next year by a middle-eastern Contractor. 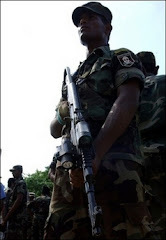 In another important development, the Sri Lanka Army has quietly raised its 3rd Commando Regiment for special operations in the Deep Battle-space (LRRP). The Unit is Commanded by a Colonel (recently promoted) responsible for the successful capture of Thoppigala and a Major from the VIP protection team that guarded the late Minister Lakshman Kadiragamar prior to his demise. The Colonel is currently reorganizing the unit for better success.